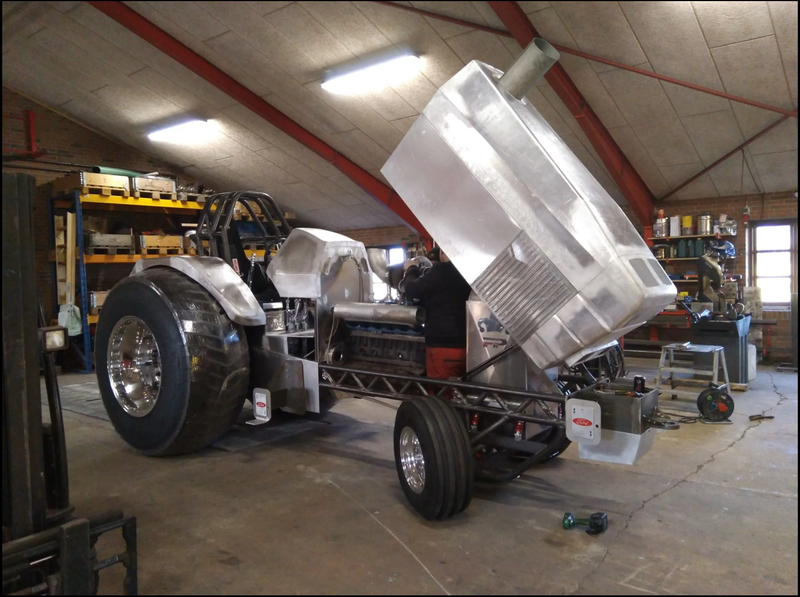 From Hebertsfelden in Germany, the Wolpertinger Pulling Team around Josef Ries are currently working and building on a completely new 7700lbs / 3.5t mod tractor with an engine that was never used on a pulling tractor on this planet before! We'll start with a little history about the German team from the deep south. The Team started with stock pulling in 1981 and just a little later in 1982, they've built their first modified tractor with 2 N/A Ford V8 engines. 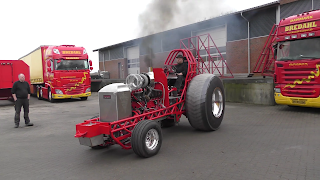 Josef and his team started with the tractor only once at their home pull in Hebertsfelden in 1982. In 1983, the V8 engines on the chassis were replaced by a turbocharged Deutz V10 engine on diesel fuel. 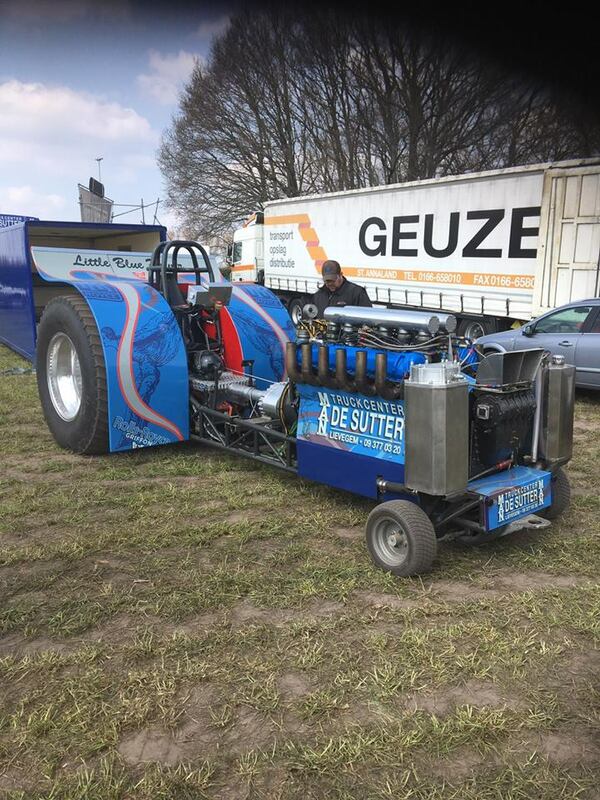 The Deutz powered machine ran in the 3.4t Mod division. In 1986, the next tractor called "Lady Emily" was built. It was the first mod tractor of the team with a Rolls Royce Griffon V12 engine. 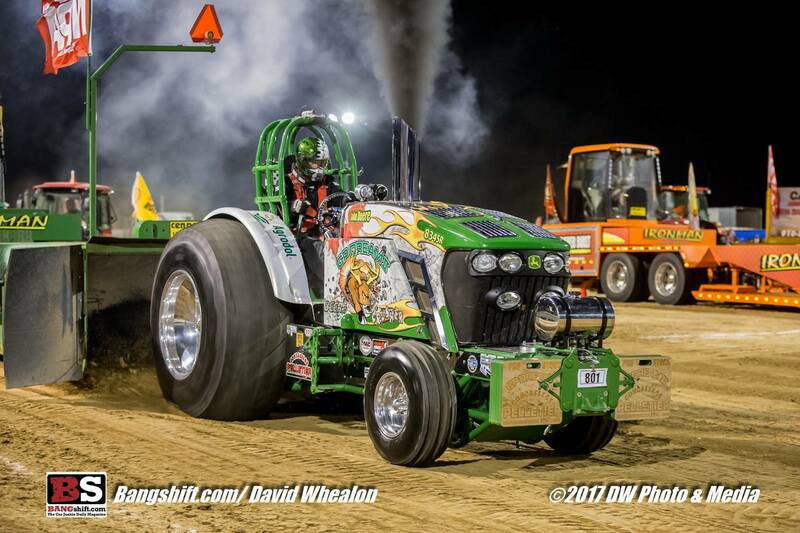 The machine competed many years in the 4.4t and 5.4t mod class. In 1988 the second Tractor with a RR Griffon V12 called "Wolpertinger" was born. 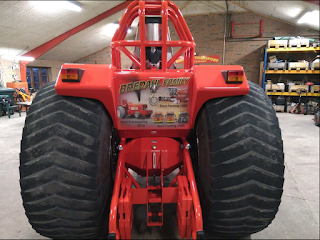 This ride was built for the 3.4t Mod class and was one of the most successful tractors of the Bavarian crew. Between 1988 and 1995, Josef and his guys finished 4 times in runner up position in the German Championship and were on the podium 123 times. In the end of 95, Wolpertinger was sold. After a 13 years absence as a participant from the pulling sport, Josef Ries purchased the tractor back in the winter of 2008. Since then he's competing in the 3.5t Mod class at some German Championship and Austrian Championship pulls. 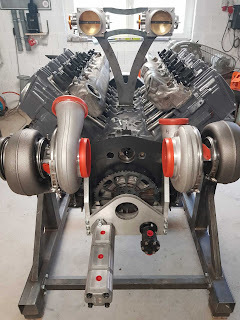 One day in 2013, Team boss Josef Ries surfed the internet and found a complete Pratt & Whitney radial engine with 28 cylinders for a not too bad price. He purchased the engine and restored the power plant with his crew during the winter of 2013 / 2014. In 2015 came the first considerations to use this engine for Tractor Pulling. After more thinking, the German team decided to build a new tractor with this radial engine. The parts sourcing for the new ride started in 2016 and the building progress began a year later. 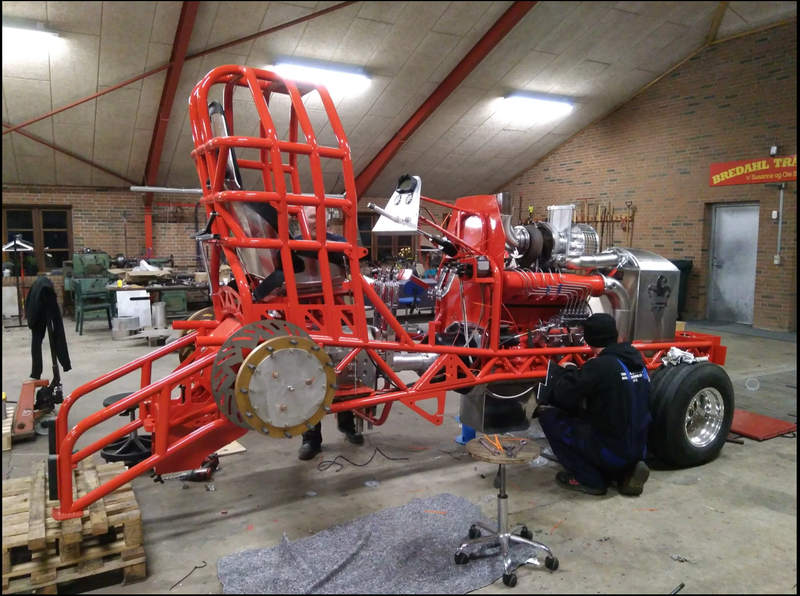 The new modified machine got a completely new homemade S355J2+N steel tube frame with a new homemade S355J2+N roll cage, homemade hydraulic steering, a new driver's seat from the Rocket Science Pulling team from Weert in the Netherlands, a completely new constructed drawbar and a machined Magirus-Deutz semi truck rear end. 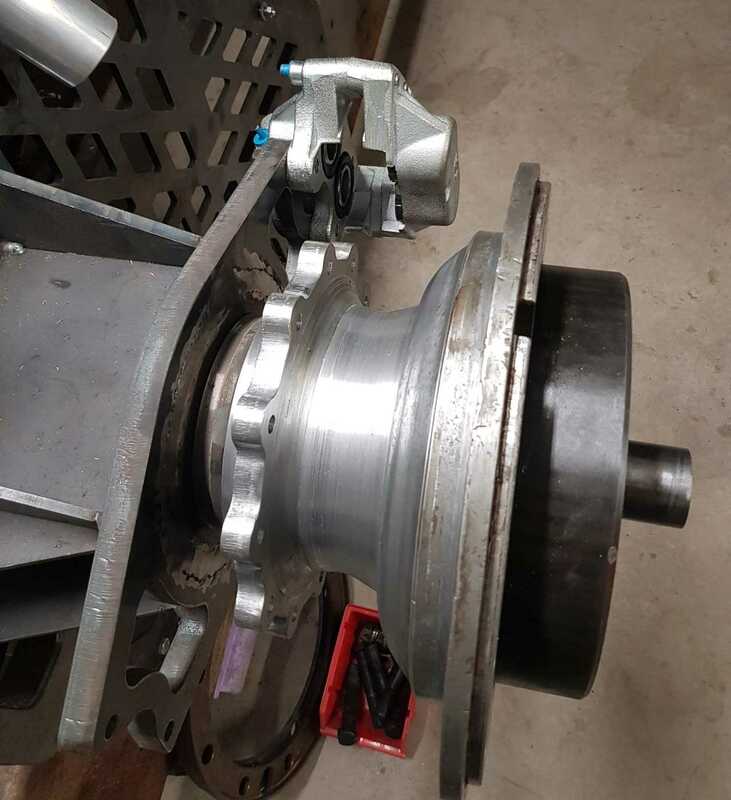 The semi truck rear end was shortened and got a Magirus-Deutz center section, a Magirus-Deutz ring and pinion gear, a needle bearing aluminum differential, ZF planetaries carrier housing with ZF planetaries from Martin Ortkrass (Iwan Pulling Team) and Mercedes Unimog brake calipers with new homemade brake discs. The Tractor will have some new homemade aluminum fenders. 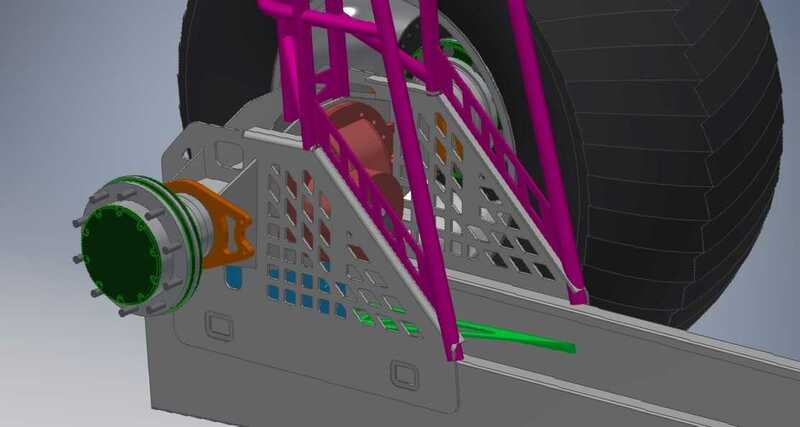 Also completely new constructed and developed is the drivetrain of the machine. 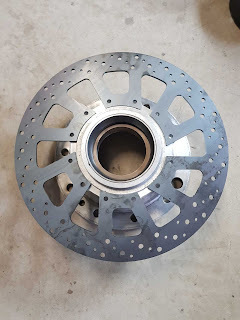 The new drivetrain is a new homemade reverser with a CNC-machined aluminum housing and custom made gears, a billet driveshaft between the clutch and the reverser, a homemade 11" inch centrifugal clutch with 5 sinter metal Crower discs and a homemade aluminum flywheel. The clutch will be protected by a light weight Browell aluminium clutch bell housing with a titanium liner. Josef Ries and his team purchased a set of new polished Northern Sheen Aluminium rims from Canada and a set of used Firestone double cut 8 ply tires for the new "Major Tom" (that's the name of the new tractor). The new mod will have an air-cooled 28 cylinder Pratt & Whitney R 4360-59 radial aircraft engine with 71.6l / 4360cui capacity on AV-gas. 18697 R 4360 aircraft power plants were built between 1945-1955 in East Hartford, Connecticut, USA. The power plant was used in airplanes like the Boeing KC97 Stratotanker, the Goodyear F2G Corsair or in the Martin JRM Mars. 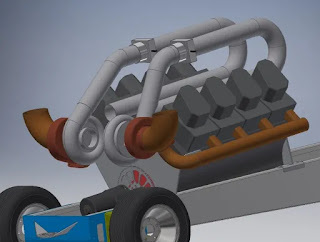 Usually, the engine has an exhaust turbocharger system, but because of the weight and the limited space on the chassis, they dismantled the system. 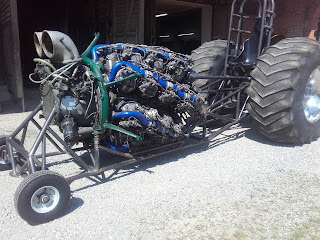 Without the exhaust turbo, the radial engine should make around 3800hp. 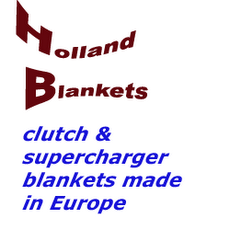 But with some changes on the gear ratio of the supercharger, it's possible to increase the power to 4300hp. At the moment they have not planned to change the ratio. For them, it's more important to have a reliable running engine. The Pratt & Whitney power plant has an original supercharger with an original aluminum air intake funnel, a R 4360-59 crankshaft with stock rods and pistons, original sleeves, original valves, and valve springs, new homemade stainless steel exhaust pipes, P&W oil pump, a homemade stainless steel fuel and oil tank, a Bendix-Stromberg R-100 B3 fuel system, 4x Bendix-Scintilla S14RN-15 ignition and a homemade data logger. The Wolpertinger Pulling Team will compete in the German Championship with the new pulling tractor. They also have planned to run in the midfield of the 7700lbs / 3.5t Mod division in Germany in the future, to get the engine running and to inspire the audience in Europe. The maiden run of the new "Major Tom" is planned for the summer of 2019. 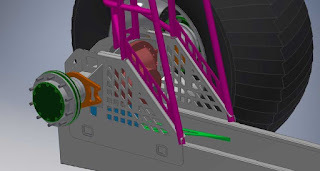 But however, currently, it depends on when the new driveline components will be done. 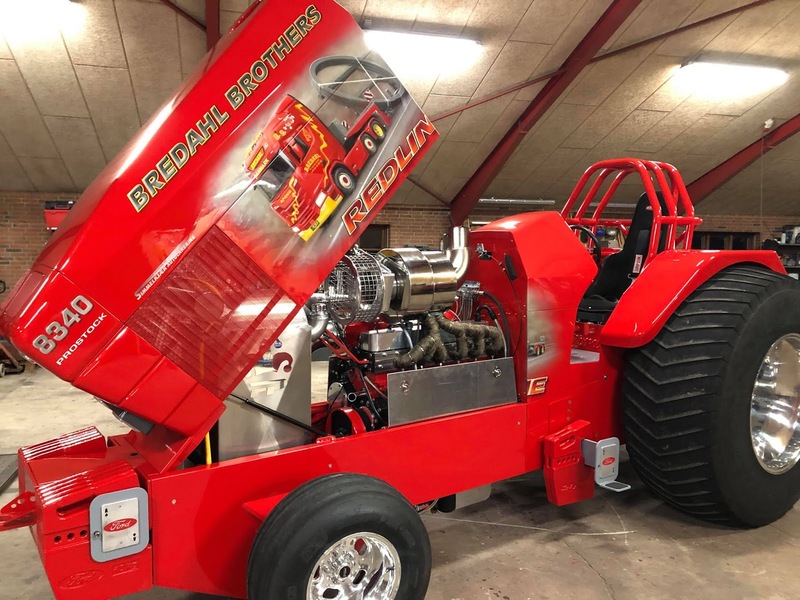 The Bredahl Brothers Pulling Team from Vildbjerg, in Denmark have built a completely new Ford Component Pro Stock Tractor during the last winter. 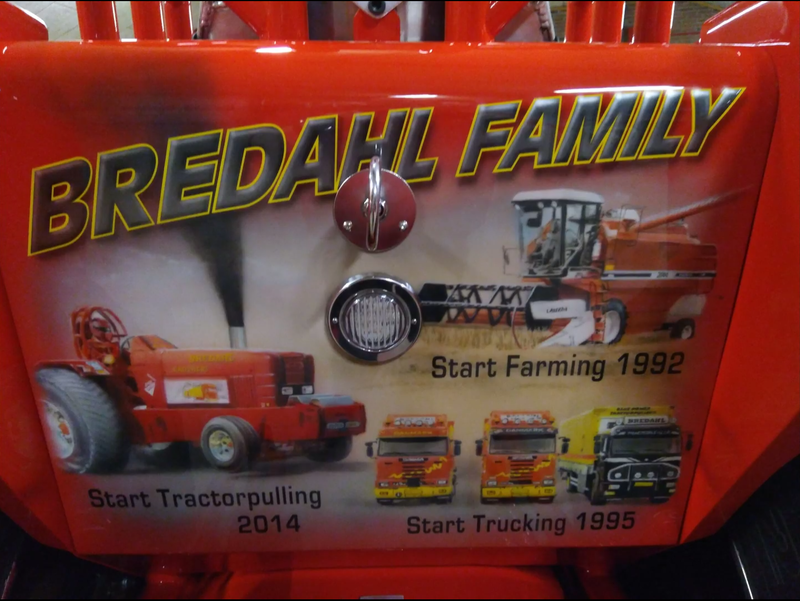 The Bredahl Brothers Pulling Team was founded by Ole Bredahl and his both sons Tobias Bredahl and Nicolai Bredahl in the end of 2013. 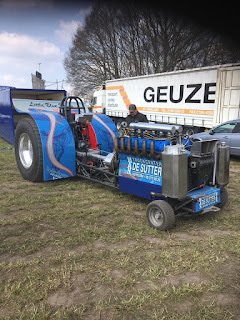 They purchased the old Ford 8340 Pro Stock Tractor called ,,Blue Bambino´´ of Niels Damgaard from Aulum in Denmark. 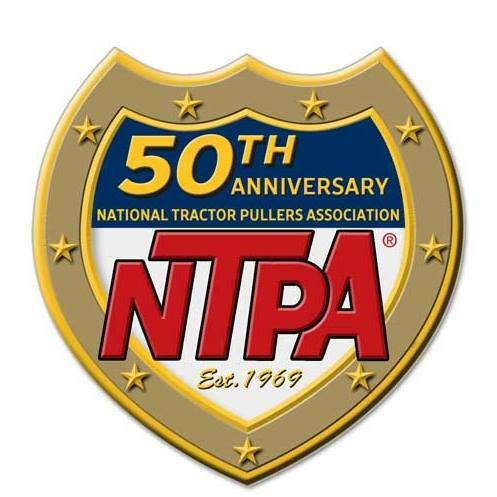 During the years the tractor was technical improved and received a lot´s of changes on the engine. In 2014, the Danish Team competed for the first time in the Danish Championship and in the Euro Cup. 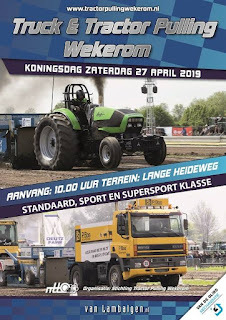 The first full season with the Ford tractor was a learning year, but it wasn't bad especially on the Danish Pulling circuits. 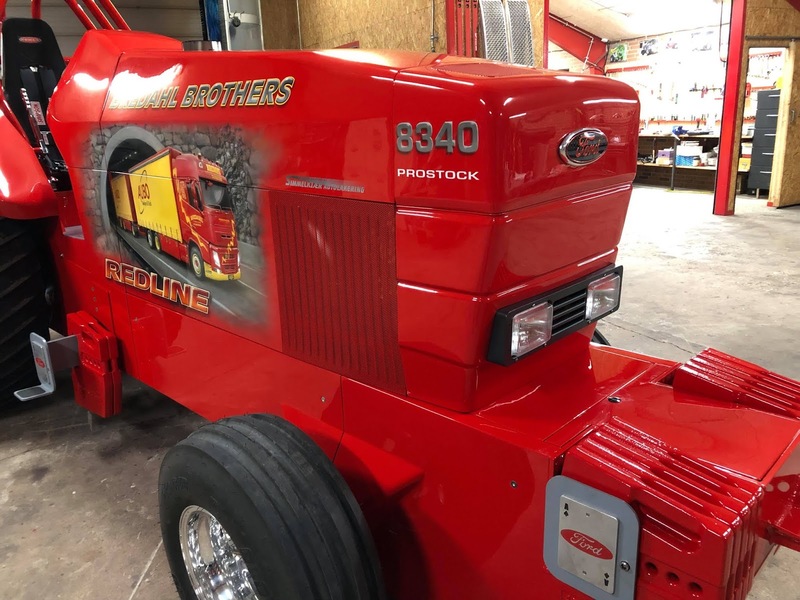 A year later in 2015, the color and the look of the Pro Stock was changed from the original Ford blue to the color red of Ole Bredahl´s Transport business called ,,Bredahl Transport ApS´´. It wasn´t a problem free season in 2015. A lot´s of problems with the engine and a broken gearbox cost them a lots of time and very important Championship points during the season. That also cost them the chance to qualify for the home EC in Brande. During the next winter the technic was further improved and the problems were solved. 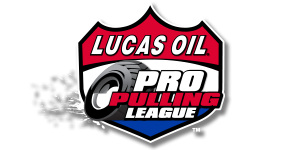 After that the Pro Stock ran pretty well without any bigger problems from 2016 until to 2018. After another power syringe in 2018, it was clearly to see the balance of the 8340 wasn´t good enough anymore. 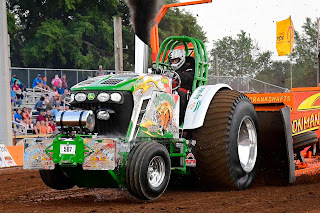 Because of the higher power of the power plant, they had not enough moveable weight on the Pro Stock anymore, simply said the tractor was too light on the front end. 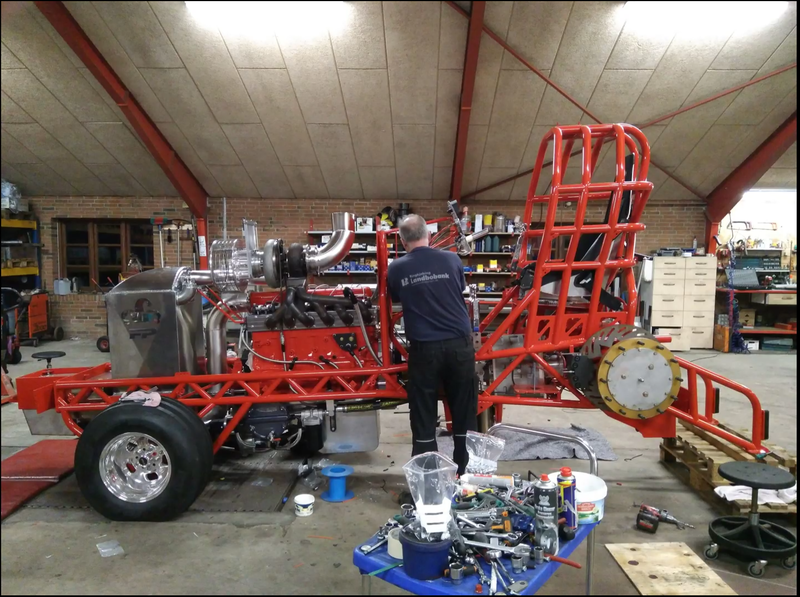 After the first Danish Championship round in Brande 2018 and a another wild ride, they decided to built a completely new Ford Pro Stock ride on Component basic. 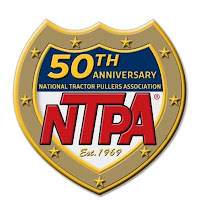 But that wasn´t the one and only problem of the old pulling tractor. 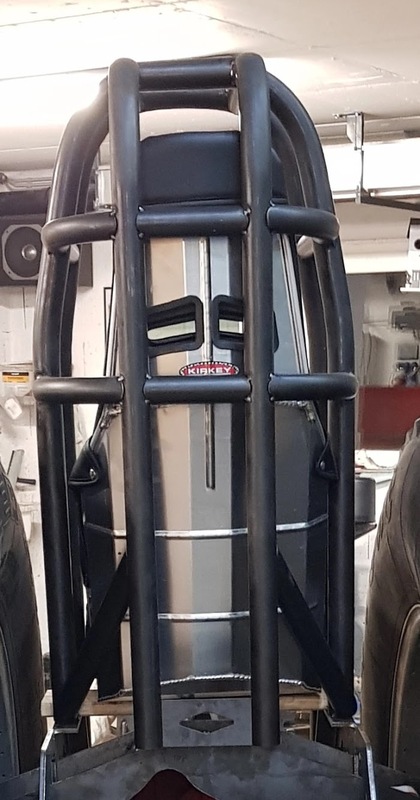 Another problem was the old machined stock rear end of the Ford was too heavy and the ring and pinion gear and the old heavy gearbox was at 2500hp on his limits. 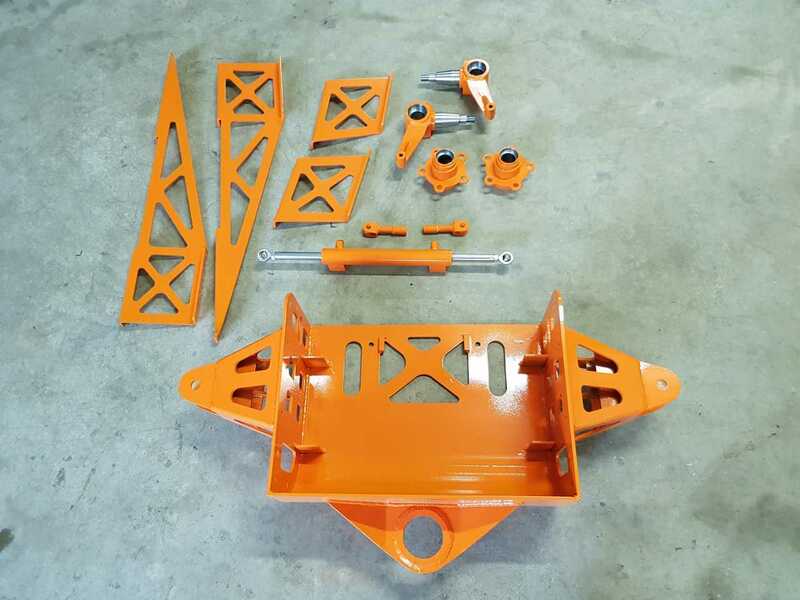 In the middle of May 2018, they went to the USA to Mike Stinson, owner of Ace Chassis from Cottontown, Tennessee to make an order for a completely new Component chassis with a new rearend, new driveline parts and a new hood. 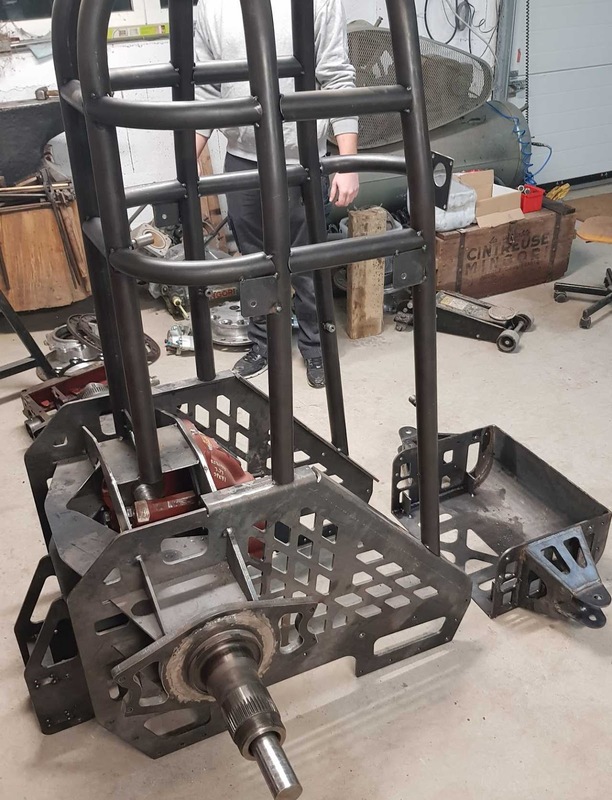 Mike Stinson started with the building of the new chassis and the sheet metal work in the end of summer 2018. The new Component chassis has a chrome-moly tube frame with a 3 bar chrome-moly rollcage, a Kirkey aluminium racing seat, a new hydraulic steering of a boat and a newly built sheet metal rearend. 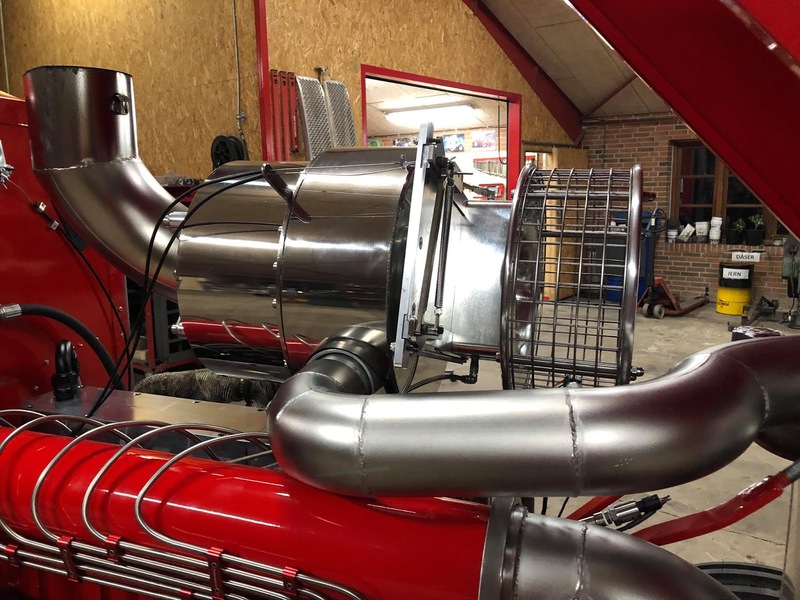 The new hood is a replica of a Ford 8340 tractor and were built off aluminium. The new 8340 aluminium hood is much lighter, higher and wider than the original hood. Also the new fenders and the sheet metal work around the chassis on the new Pro Stock were done off aluminium. All those work were made by Mike Stinson and his Team of Ace Chassis in Cottontown. The new sheet metal rearend received a Rockwell center section with a Rockwell needle bearing diff, a Rockwell ring and pinion gear, new billet Franklin aluminium planetary carrier housings with Franklin planetaries and new Engler Machine & Tool billet aluminium brake calipers with new steel brake rotors. The completely new drivetrain has a new Profab 4 speed heavy duty transmission with a billet driveshaft between the transmission and the clutch, a B&B 11´´ inch centrifugal clutch with a steel fly wheel from the John Deere Pulling Team in Thy, Denmark and a Browell aluminium clutch bell housing. For a optimum grip on the Danish and European pulling tracks, the Bredahl Family purchased a set of new polished Northern Sheen aluminium rims with new Firestone Puller 2000HP Pro Stock tires from the John Deere Pulling Team in Denmark.The new tires were cut by Michael Galsgaard of the John Deere Pulling Team. 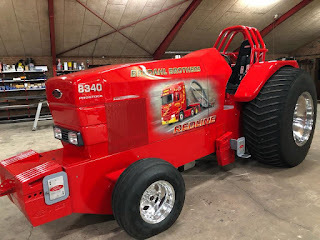 After everything was done in the Ace Chassis workshop, the new tractor was loaded into a container and went across the pond on a ship to Denmark before christmas. 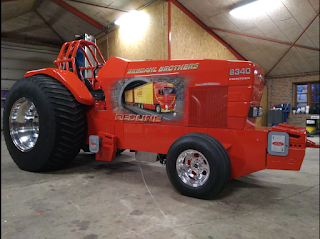 After a 3 week sea trip the new tractor without the engine finally arrived at the 16th of January 2019 in the workshop of the Bredahl Brothers Pulling Team in Vildbjerg. 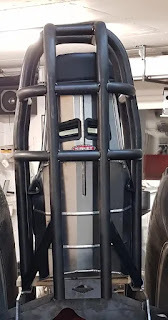 Shortly after that the whole chassis, the hood and fenders went too the painter. 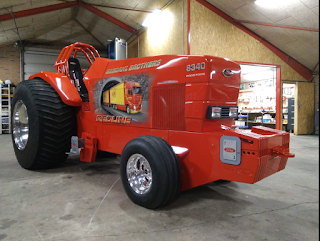 The paintjob were done by the company called ``Simmelkjaer Autolakering & Skilte´´ from Sunds, Denmark. The tractor also received a nice airbrush paint job with the Scania semi trucks of their company on the side shields of the hood. Another very nice airbrush paint work is on the back of the tractor with the activities what they are doing alongside of the pulling sport, like farming and the transport company. Ivar Asland from Finsland, in Denmark did all the airbrush paint job work on the Pro Stock. 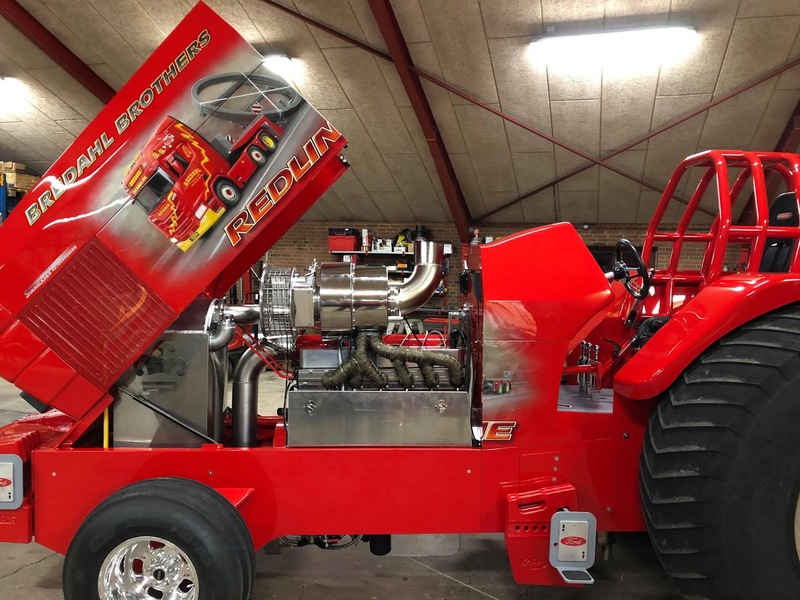 The new Bredahl Brothers Red Line is powered by a turbocharged 6 cylinder Ford Powerstar engine with 8.3l displacement on diesel fuel. The original engine had a displacement of 7.5l and was used in the Ford 8340 Tractors, who was built between 1991 and 1997. But the pulling engine received a lots of changes and special built parts. 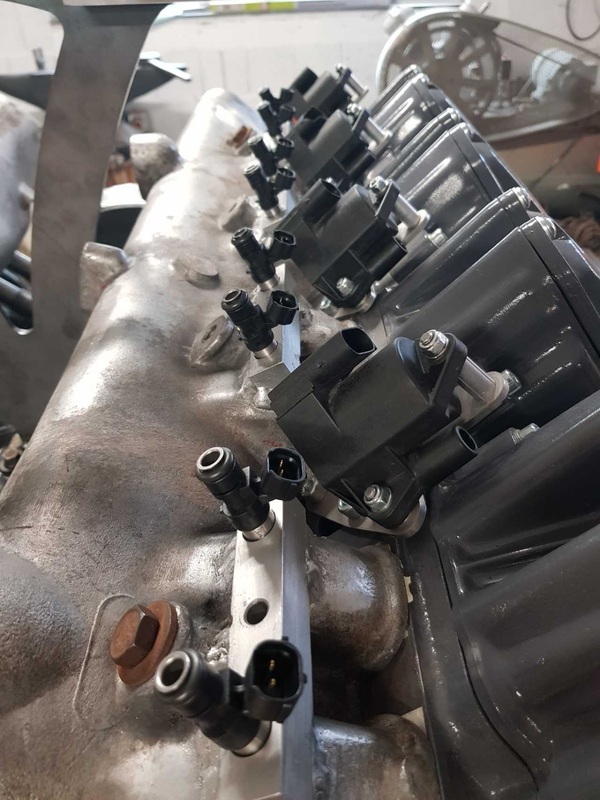 Because of the much higher compression, the most of the original parts like the rods, pistons and many more would not survive those power increase and sometimes the rough pulling conditions. The engine was took over of the old Bredahl Brothers Red Line Pro Stock Tractor, but received a lots changes and new parts during the last winter. The power plant has a machined Ford Power Star stock engine block with Darton sleeves, a billet steel crankshaft by the company called ``crankshaft.be´´ from Belgium, GMS (Genes Machine Shop) billet steel rods and GMS billet aluminium pistons, a revised Ford Power Star OEM cylinder head with new stainless steel valves and new stronger valve springs by the Dingo Pulling Team, a new homemade stainless steel intake and exhaust manifold, a billet Holset HX82 turbocharger with a 5´´ inch intake impeller wheel from the John Deere Pulling Team in Denmark, a new Freakshow Performance Intercooler built by Finn-Lasse Streyl from Germany, a billet Columbus Diesel Supply (CDS) fuel pump with 17mm elements, a Aviaid oil pump and a complete Racepak data logger. 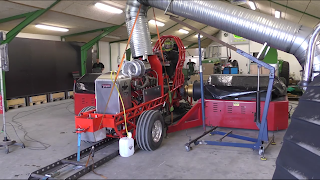 After the Tractor was almost ready, the team went with the new Component Pro Stock to the John Deere Pulling Team in Thy, Denmark to make some test passes on the dyno. 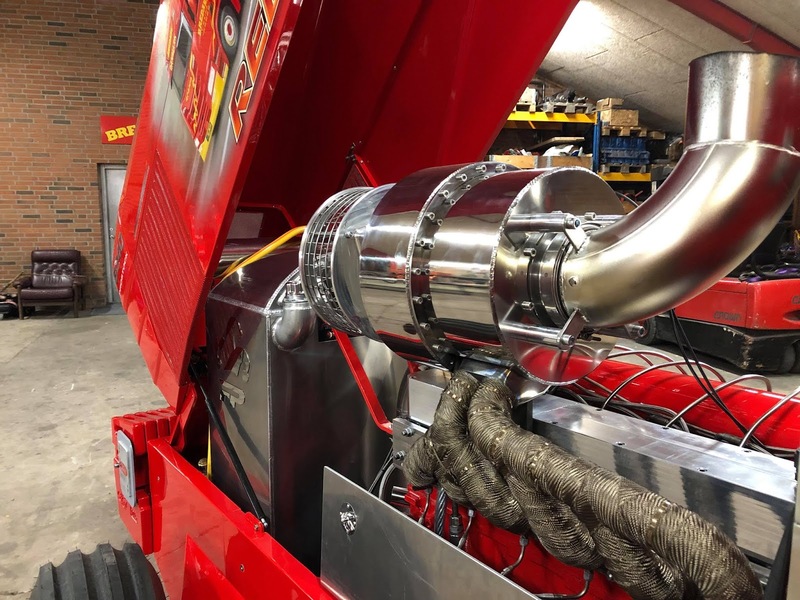 More than 2500hp made the engine on the dyno, but they had some problems with the new pump of the water injection system. At the European Superpull in Ahoy, Rotterdam, the Netherlands the new Bredahl Brothers Red Line had its maiden voyage in front of the sled. But it wasn´t a successful first pull. They had again problems with the new water injection system of the engine. The result was 42,40m and a 6th place. Back in the workshop they have dismantled the whole engine and found 6 broken pistons, who was melted because of the not correctly working water injection system. So still a lots of work for the Danish Team to sort out all problems before the outdoor season starts. 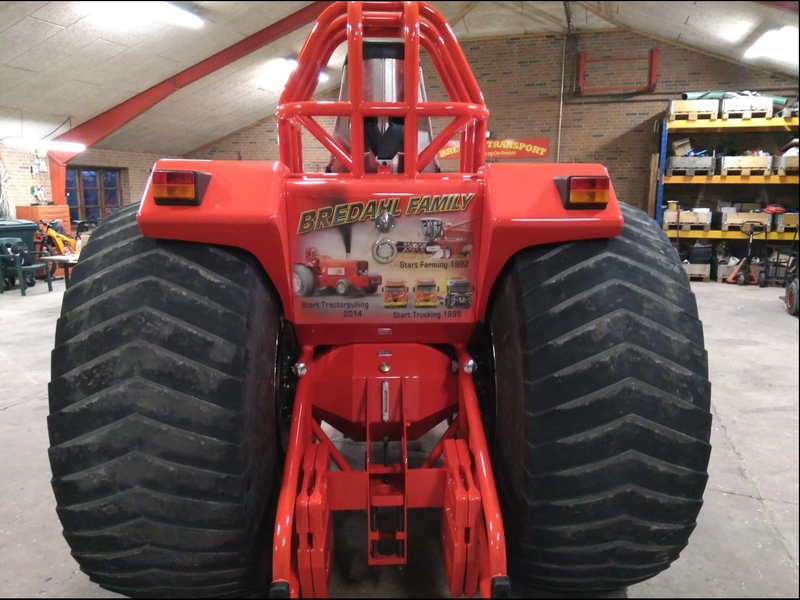 The Bredahl Brothers Pulling Team have announced to compete in the Danish Championship and in the Euro Cup this year. In the last 13 years Luxembourg had two teams in the sport with the Roude Leiw Pulling Team and the Wild Star Pulling Team . 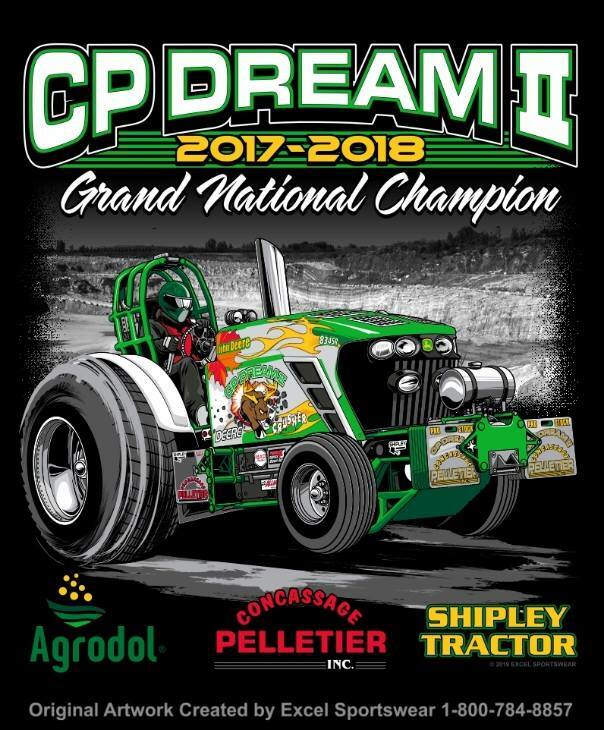 From 2019 on the little country will have a third pulling team who will compete on the pulling tracks in Germany. It's the Bear Pulling Team around Frank Medinger from Contern in the middle of Luxembourg. The young team was founded in the spring of 2018. 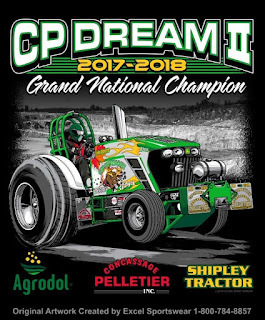 Tractor Pulling is not an unknown territory for the team, especially not for Frank Medinger. 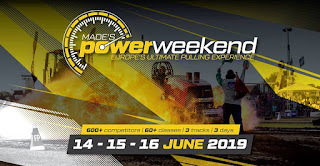 He has been visiting Tractor Pulling events as a spectator in Europe for some 30 years and knows the sport very well. 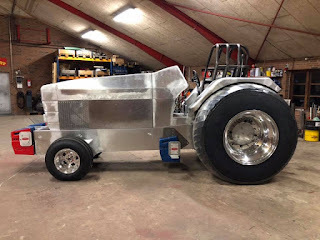 Why has the team decided to build a Limited Mod Tractor with an V8 semi truck engine? They always had in mind to build their own pulling tractor and with the new Limited Modified class in Germany it seemed possible to realize a modified tractor on a limited budget. 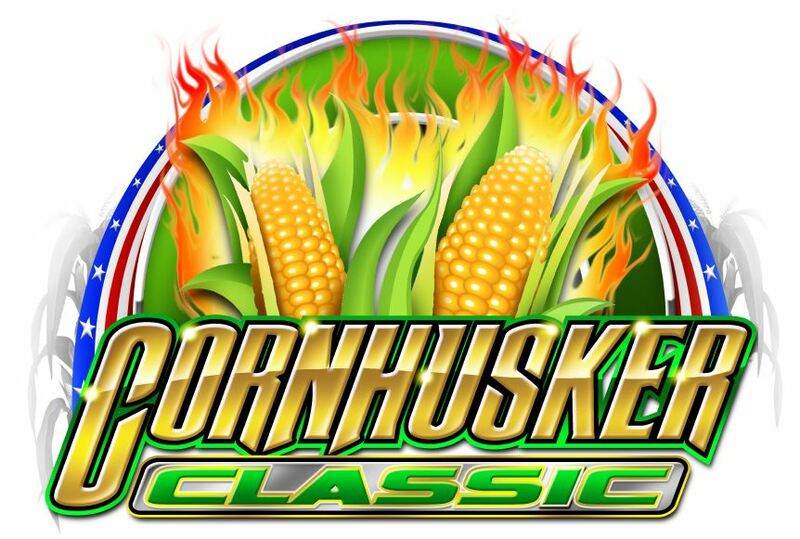 The hopes with the new Limited Mod are to get everything ready for the first event of the season. All major and hard to organize parts are in the workshop, now it’s all about getting everything together. After the first parts were organized, the guys started with the construction work of the new vehicle on the computer. 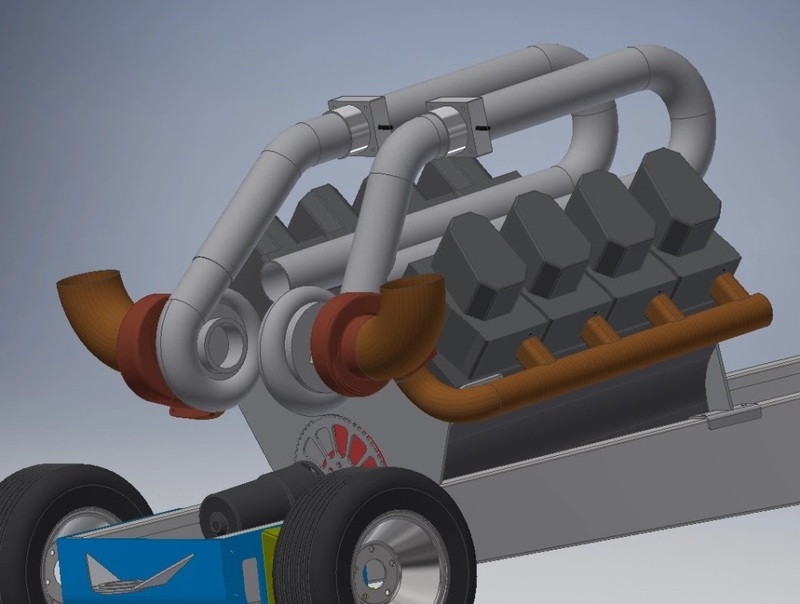 The new tractor is completely designed, constructed and built in a CAD program. Frank Medinger did all the CAD and construction work on the computer. 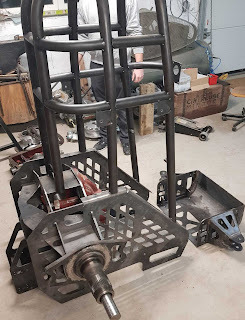 The new tractor will get a used steel wedge frame with a newly constructed homemade 25CrMo4 rollcage, a Kirkey Racing seat from the USA, a homemade hydraulic steering, new homemade wheelie bars, and a newly constructed drawbar with a homemade sheet metal rear axle housing. 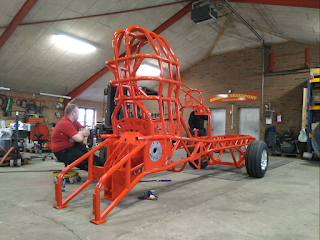 The frame rails for the new mod come off the former Red Painter Modified Pulling Tractor in Cloppenburg, Germany. Also, the used aluminum sheet metal fenders for the new project came off a former Red Painter team's tractor. The newly built sheet metal rear axle housing will have a Rockwell / Meritor aluminium center section with a stock Rockwell differential, an original Rockwell ring and pinion gear, machined MAN / Mercedes aluminium planetary carrier housings with stock MAN / Mercedes planetaries and 4 piston Iveco brake calipers with homemade steel brake rotors. Also, the drivetrain of the Limited Mod will be completely new constructed. The new drivetrain will get a new 11-inch centrifugal clutch with 5 discs and a billet flywheel from Freakshow Performance in Germany, a homemade steel clutch bell housing, a self-machined steel drive shaft between the clutch and reverser and a new homemade reverser based on Eaton / Fuller parts with a CNC-milled aluminum housing. 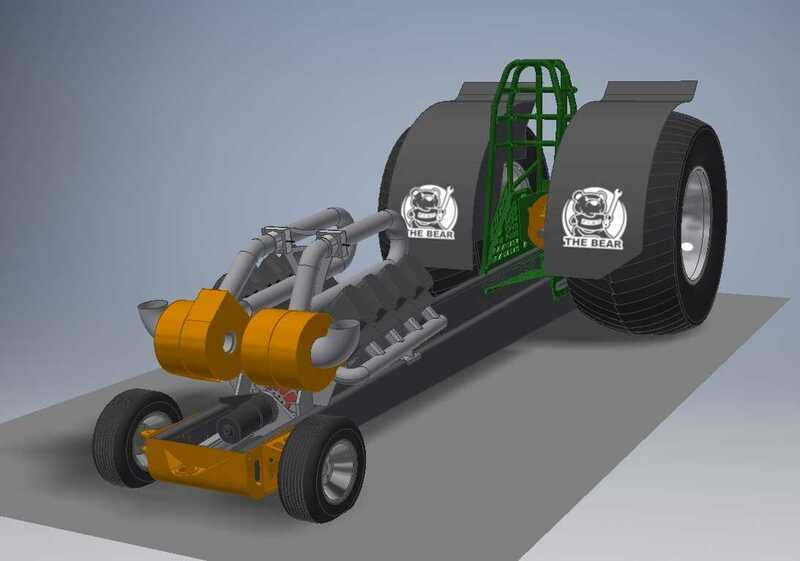 The first plan was to build a 3-speed gearbox configuration out of Fuller parts, which was canceled in favor of a lighter reverser only style gearbox. 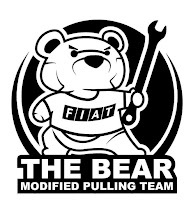 The team is only running one class (Limited Mod) so they will try to get the right overall gear ratio with the ring and pinion gear and the planetaries. The Bear Pulling Team have bought for their new ride a set of good used cut Firestone Puller 2000HP tires on polished Midwest aluminum rims from the Roude Leiw Pulling Team in Luxembourg. 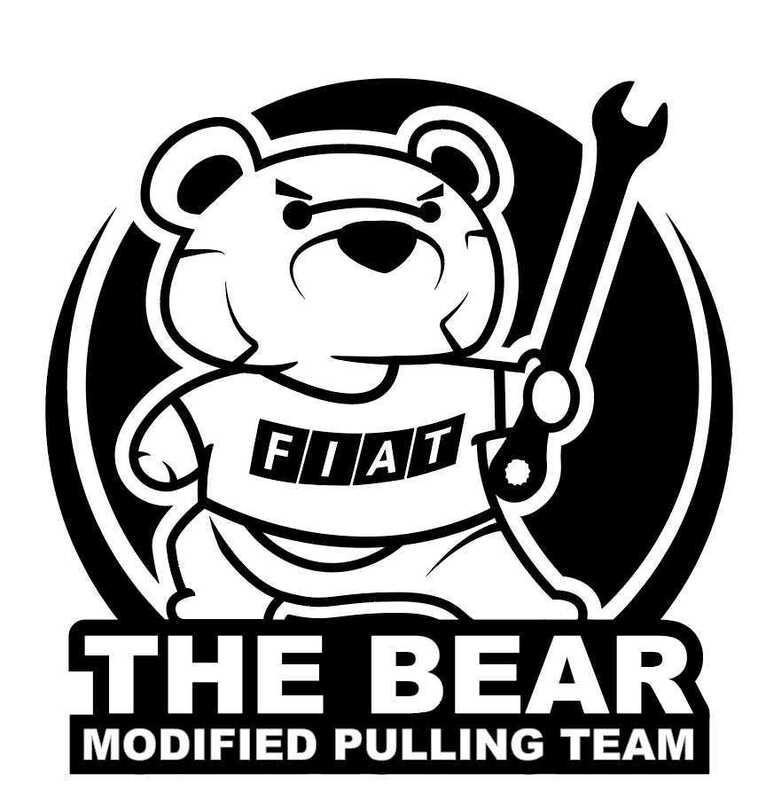 The new tractor called ``The Bear´´ will have an 17.2l / 1050cui Fiat 8280 V8 semi truck engine with 2 turbochargers on methanol fuel. 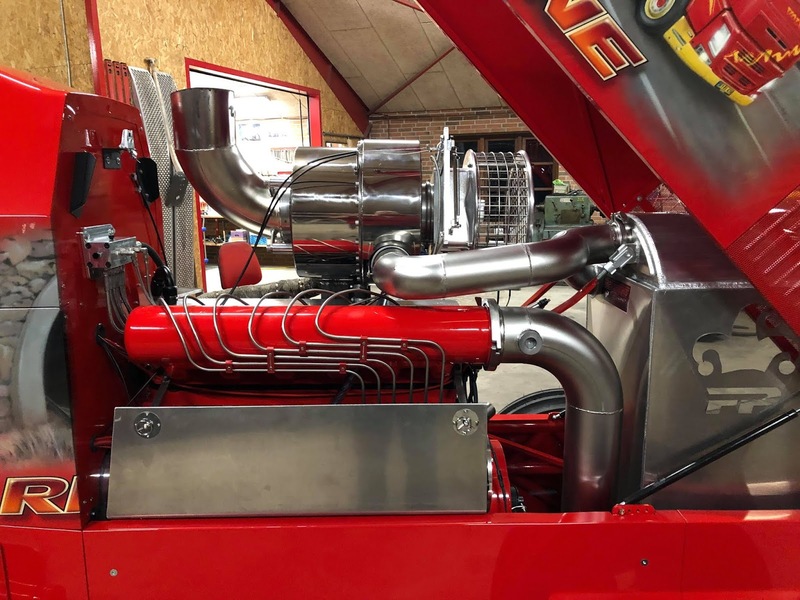 This V8 truck engine has been and is currently used successfully by several European truck and tractor pulling teams, either on Diesel or methanol fuel. One of them is the Hvilsom Pulling Team from Hobro in Denmark with their Light Modified Tractor called ``Elkaer Metal Boy´´, who finished in runner-up position in the 2018 Euro Cup points. The Italian powerplants were also sold under the Iveco brand name, because Iveco is a subsidiary company of the Fiat group. The Fiat / Iveco 8280 engine was developed and built between 1979 and 1993 for the Fiat 300 and Iveco 330 Truck series and had an excellent reputation for robustness and reliability. On diesel fuel, the engine had a power of 352-420hp with a torque of 2050Nm at 1100rpm. 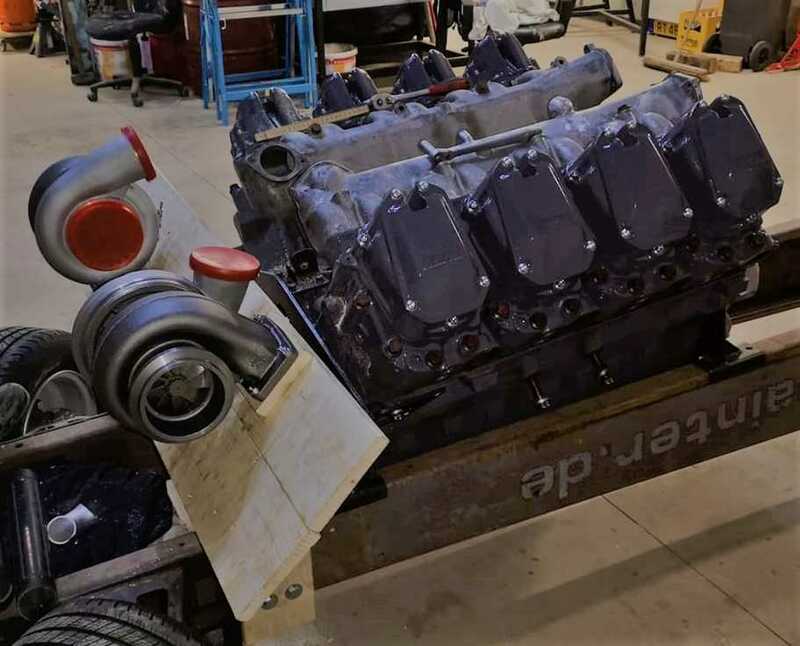 The pulling power plant will have a stock Fiat 8280 cast iron engine block with stock Fiat 8280 sleeves, a reground stock crankshaft, Fiat stock rods and machined Fiat pistons, modified 8280 cylinder heads with 4 valves per cylinder, stock valves and valve springs, the stock cam, a homemade stainless steel exhaust manifold, a homemade aluminium intake manifold with modified Fiat intake parts, 2 copies of Borg Warner S400 turbochargers with billet 88mm compressor wheels, an Enderle fuel pump, a modified Megasquirt EFI system (controlling two 2200cc injectors per cylinder), a self-built sheet metal methanol fuel tank, a modified stock oil pan, a external 3 stage oil pump, based on a hydraulic excavator pump, automotive individual ignition coils (coil near plug) and a homemade 20 channel data logger system with the possibility to communicate with the EFI system over CAN. The Fiat pistons are modified to reduce the engine’s compression ratio, the stock crankshaft was reground in house to have a higher main bearing clearance and the diesel injectors in the cylinder heads were replace by spark plugs. With all those changes the twin turbocharged V8 engine on methanol should make around 2500hp. 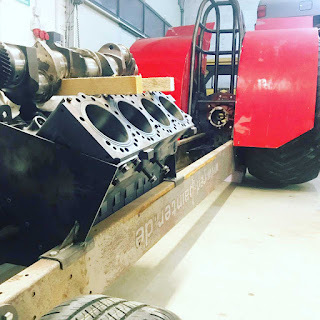 The stock camshaft will probably be one of the first parts on the power plant to be changed by the team when the tractor has made its first pulls. The original cam then be replace by a reground version or a new billet one.. Currently they have no big plans with the new Limited Mod for the future. There is a lot on the tractor, which so far only works on paper. 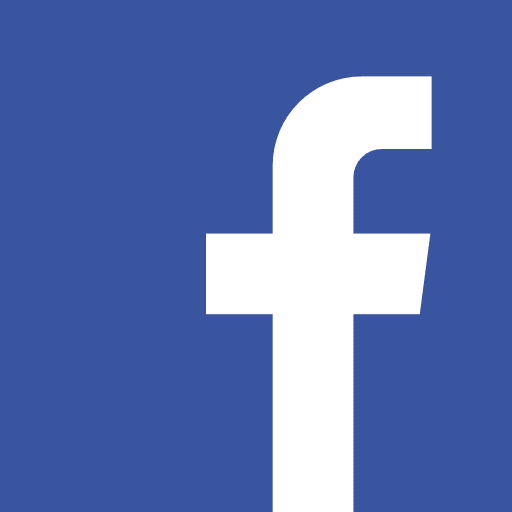 ``If everything works and performs as expected, and we have gained enough experience, there is certainly room for improvements´´, said Frank Medinger. The maiden run of the new 7700lbs / 3.5t Limited Modified machine is planned for the 2nd of June 2019 in Volkmarst, Germany. 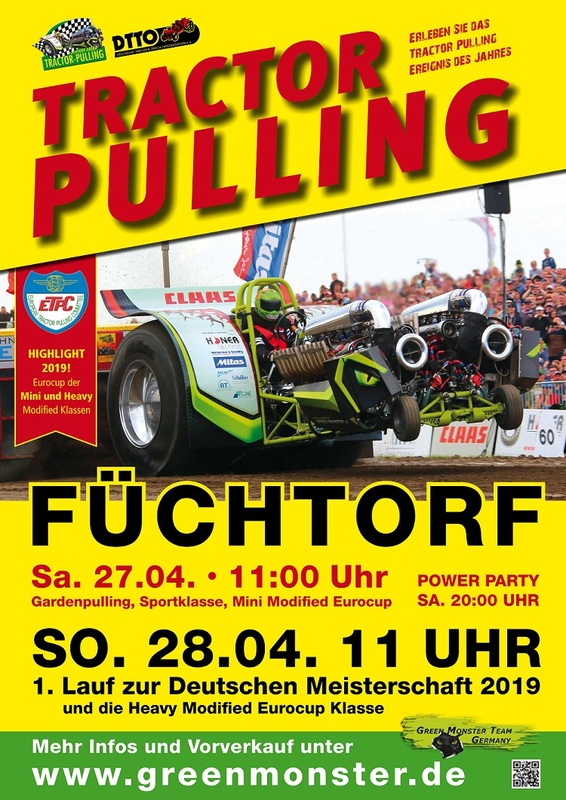 27th and 28th of April = Last weekend of April = Tractor Pulling Füchtorf is approaching!